I couldn’t disagree more with the weekend Daily Newseditorial (Opinion, Aug. 27 & 28). Megaload protesters are fighting the right fight. If global warming isn’t stopped, it’s the end of this planet as we know it. This weekend’s editorial (Daily News, Aug. 27 & 28) about the megaload protests in Moscow is amazingly superficial for professed journalists. By removing all context, you trivialize the protest as a futile attempt to stop an oil company truck. ponytails” in response to the movement of ExxonMobil’s megaloads up U.S.
morning and saw on DNews.com a photo, taken by Daily News photographer Dean Hare, of my exact prophecy. Two protesters of the Imperial Oil/ExxonMobil megaload that began its trip from Lewiston late Thursday were arrested outside Coeur d’Alene on U.S. Highway 95 while monitoring the shipment’s progress early Saturday morning. Helen Yost said she and another woman had been part of a group that was monitoring the load early Saturday when they were arrested by an Idaho State Police trooper. UPDATED: Saturday, August 27, 5:00 pm Idaho State Police told Citydesk that two more mega-load protesters were arrested Saturday morning in Coeur d’Alene. 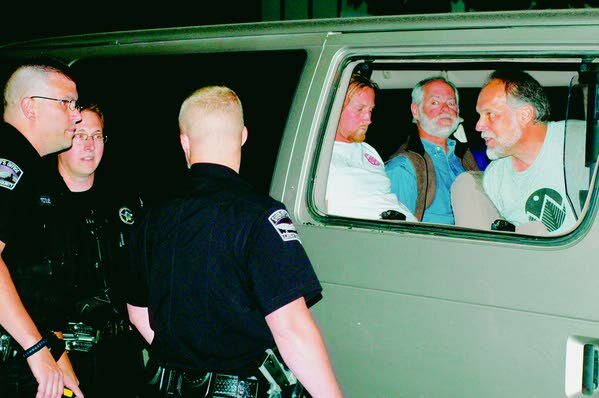 That brings to eight the number of persons taken into custody, expressing their displeasure of the oversized rigs heading for the Kearl Oil Sands Project in Alberta, Canada. 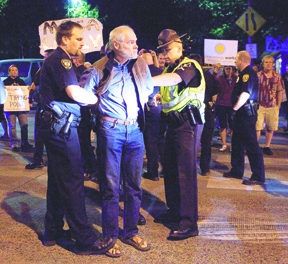 ORIGINAL POST: Friday, August 26 Six people were arrested early today, protesting mega-loads as the huge rigs rolled through their Latah County community. The six, members of Wild Idaho Rising Tide, took part in a larger protest which saw several people lie down in the middle of Washington Street in Moscow, as scaled-down ExxonMobil mega-loads rolled on Highway 95 toward Coeur d’Alene before heading east on I-90 and north to the Kearl Oil Sands Project in Alberta, Canada. 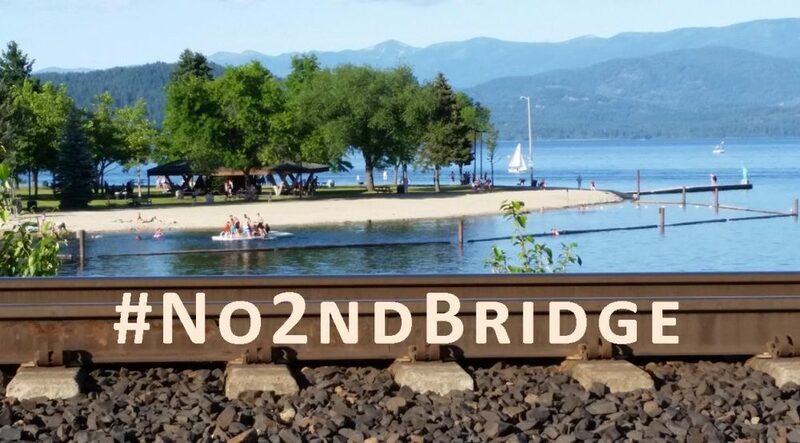 Three more protesters were arrested early Saturday in Coeur d’Alene as a megaload shipment of oil excavation equipment passed through the Lake City. Law enforcement officers confirmed that the arrests were made by Idaho State Police, but the names were not released. One woman taken into custody had refused to identify herself, officials said. A member of the Moscow Police Department (left) and an Idaho State Police trooper arrest a protester Friday morning in Moscow. 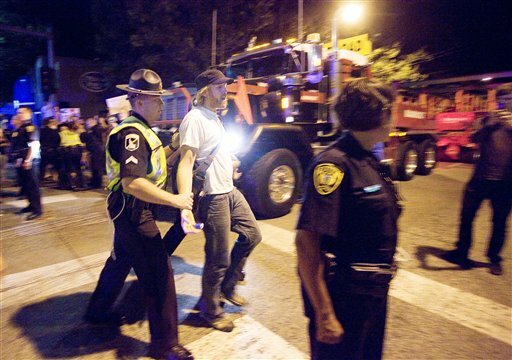 Six Moscow protestors were arrested after an Imperial Oil/ExxonMobil megaload was blocked early Friday at the intersection of U.S Highway 95/Washington Street and Third Street in Moscow. Those arrested were Brett Haverstick, 38; Mitchell Day, 40; Vincent Murray, 61; David Willard, 52; Gregory Freistadt, 26; and William French, 55, said Capt. Lonnie Richardson, of the Idaho State Police in Lewiston. There are 25 scheduled stops along U.S. Highway 95 for the Imperial Oil/ExxonMobil megaload shipment, but environmental activists created a noisy, lengthy unscheduled stop in downtown Moscow early Friday morning. Moscow, Idaho, crowds expand around sitting and standing Wild Idaho Rising Tide protesters who stopped an ExxonMobil/Imperial Oil tar sands shipment on August 25-26, 2011 (Tom Hansen photo). About 150 people gather around Wild Idaho Rising Tide protesters during their August 25-26, 2011, demonstration of peaceful civil disobedience against ExxonMobil/Imperial Oil tars sands transports permitted by the Idaho Transportation Department through Moscow, Idaho (Tom Hansen photo).